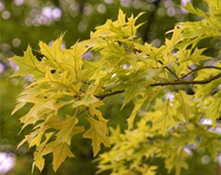 Red Maple, Pine, Oak and Tulip trees and Euonymus may exhibit chlorosis. Many soils in Ontario have an alkaline pH. 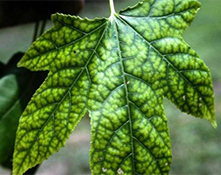 Symptoms of iron and manganese deficiency appear as yellow leaves with green veins (“interveinal chlorosis”). Manganese deficiencies are more common than iron deficiencies. Chlorosis is a physiological problem. 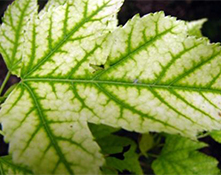 The term ‘Chlorosis’ refers to yellowing of the foliage and may have many different causes. Iron chlorosis is common on pin oaks, while chlorosis in red maples is commonly caused by a manganese deficiency. The availability of certain nutrients necessary for plant growth and development are limited by soil pH. In alkaline soil (pH>7.0), these nutrients are usually present in the soil, however they may not be in a form that can be utilized by the plant. Waterlogged and /or compacted soils may also cause foliage to appear chlorotic, especially with evergreens. Before attempting any treatments, determine the cause of chlorosis. Test soil to determine pH. A foliar analysis can also help confirm a nutrient deficiency. Soil amendments such as elemental sulfur to lower pH, or lime to raise pH or injection of micronutrients may be effective. Success has been reported using fall soil injection of ferric ammonium citrate to treat chlorotic pin Oaks. Maintaining proper health care practices, diligent water management and aeration of the soil may also help to reduce the effects of chlorosis.